We’d love your help. Let us know what’s wrong with this preview of The Land of Darkness by C.S. Lakin. To ask other readers questions about The Land of Darkness, please sign up. Jadiel is a young 12 year old girl who loves her father and misses her mother, who died the year before. On top of grief for her mother she has to deal with her new step-mother, Huldah, and her two daughters. Huldah quickly feels the need to put Jadiel in her place making her do difficult house chores. Still the witch, Huldah, doesn’t like Jadiel taking up time with her new husband and his wealthy estate. To get rid of this nuisance she devises ways to kill young Jadiel. After a couple attempts Huldah comes up with an impossible mission; find the Tree of Youth and bring back a satchel full of its leaves. If she doesn’t Jadiel’s beloved father will die at the next full moon. Only thing is… no one knows where this tree is, or if it even exists. Callen, a young carpenter discovers some old drawings of a bridge, a magnificent bridge, unfortunately no one knows who made it. Determined to find this bridge and learn of it’s creator Callen takes leave of his apprenticeship to find it. Only thing is… no one knows where this bridge is, or if it even exists. These two seekers find each other on the road, Callen fearing for the young girls safety (Who just happens to be his apprentor’s niece.) Offers to help Jadiel with her mission to save her father. Traveling across the land they learn of the bridge’s creator, the Tree of Youth and so much more. Once again I was entrapped in the wondrous realm of Sherbourne and it's surrounding lands. The hidden magic the world holds and the innuendoes to the previous 2 books — The Wolf of Tebron and The Map Across Time, in the Gates of Heaven Series by C.S. Lakin — had me feeling at with home with The Land of Darkness. The speed of this tale is one of Lakin's best. The Land of Darkness starts out a bit slow and cumbersome but when I reached part two I was having trouble putting this adventure down. I was blown away at how easily Lakin places facts and stories from other books of the Gates of Heaven series in her stories yet they can be read as stand alone novels. Seeing references to Adian, Tebron and other things would just make me smile. Now the main tale is about Jadiel and her conflict with Huldah. But Callen had his own villain stalking him a Golgoth, the dark creature from another world that can kill armies in a matter of days. This added a great twist and suspense to the plot, giving it a more grown up feel to your normal fairy tale yet keeping it very friendly for younger readers. C.S. Lakin also did a wonderful job of laying the mood of the story and scenes. Many times I would find myself holding my breath hoping Callen wouldn’t open the door or wanting to jump for joy when Jadiel was freed from the slavers. At other times I was irritated at the characters for not understanding, or practically yelling at them trying to tell them to believe. The characters in this book had as much personality as the other books in this series. From talking boars and frogs, to the strange man constantly speaking in riddles. Good story, but I didn't like it as much as the first two, which I thought were spectacular. It was partly because I didn't love the characters. (Callen got on my nerves sometimes; Jadiel was good, but perhaps she wasn't distinctive enough? I don't know; I most value character types I haven't met before.) I thought the villainous, abusive Huldah was dwelt on a little too much, though fortunately by the middle of the book and beyond she has far fewer scenes. And there was an element of creepiness Good story, but I didn't like it as much as the first two, which I thought were spectacular. It was partly because I didn't love the characters. (Callen got on my nerves sometimes; Jadiel was good, but perhaps she wasn't distinctive enough? I don't know; I most value character types I haven't met before.) I thought the villainous, abusive Huldah was dwelt on a little too much, though fortunately by the middle of the book and beyond she has far fewer scenes. And there was an element of creepiness woven throughout the story; I don't "do" large doses of that. But the things I did like were manifold. As always, I enjoyed C.S. Lakin's descriptive writing. The fairytale theme (Cinderella, Snow White, maybe even Rapunzel/Tangled) was strong in the first half, and then the Biblical allegory took over. The allegory was quite obvious, so it felt like I was reading the wonderful Biblical story of Yeshua's (Jesus) redemption of mankind, which was lovely, but it did shave away pieces of originality. But oh well---at the same time, I love how it made me ponder our salvation. And the Scripture verses used to enhance the story were so rich! Sprung from apocalyptic vision, this adult fairy tale, which is the third in the Gates of Heaven series, brings freshness and vibrancy, based on strong ethical principles, to the realm of the imaginary. The darker side is inevitably omnipresent throughout this mythical world, forming a major crux of the story. The sensual and tangible presence of evil can be seen most clearly in the murderous intent of the avaricious stepmother, Huldah, whose ruthless desire to retain her own outward, thinly ven Sprung from apocalyptic vision, this adult fairy tale, which is the third in the Gates of Heaven series, brings freshness and vibrancy, based on strong ethical principles, to the realm of the imaginary. The darker side is inevitably omnipresent throughout this mythical world, forming a major crux of the story. The sensual and tangible presence of evil can be seen most clearly in the murderous intent of the avaricious stepmother, Huldah, whose ruthless desire to retain her own outward, thinly veneered beauty drives her to send her innocent and truly beautiful stepdaughter on an errand to find, and bring back to her, leaves of the Terebinth Tree that offer the enticing promise of eternal youth. Through Huldah’s determination not to allow anyone or anything to stand in the way of her own selfish imperative, she sets in motion the quest of the main female protagonist, Jadiel, who is intent on saving her father, whom she dearly loves, from an otherwise certain death at her stepmother’s hands. The comparative innocence of Jadiel stands in stark contrast to the malevolence and worldliness of Huldah, whose distortion of the world around her is juxtaposed against the sweetness of the rapport that Jadiel has with the natural elements that constitute her surrounds. In this way, both Jadiel and Callen are bound, both physically and spiritually, to embark on a course of action along which they inevitably encounter each other and advance to what seems to be their preordained end. The development of the strength and integrity of their characters is intricately wound together with the symbolism of the story, of which the primary element is the transcendence of the merely physical and shallow to the ultimate attainment of the good, the noble and the everlasting. The striking poignancy of the well-rounded characters and their interaction with such diverse creatures from the natural world as frogs and camels, imbued with magical abilities, such as the power of speech, is bound to appeal to any reader who has empathy for others. The deeper aspects of the story are present throughout the text of The Land of Darkness for all those who are able to respond imaginatively and spiritually to the tale. 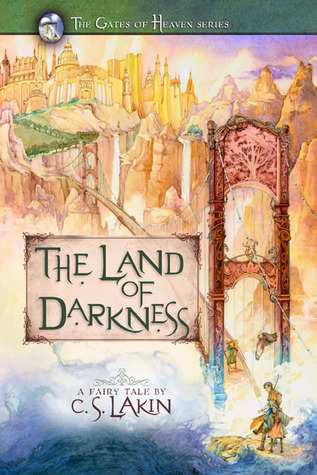 The Land of Darkness is the third fairy tale in C.S. Lakin’s Gates of Heaven series, this time following the quest of a twelve-year-old girl named Jadiel and her unlikely companion, a woodworking apprentice who is obsessed with finding a legendary bridge. Driven out by her evil stepmother to find the eternal-youth-giving leaves of a tree, Jadiel has only thirty days to come home victorious, or her stepmother will kill the one she loves most—her father. Young and innocent, Jadiel nearly ends her j The Land of Darkness is the third fairy tale in C.S. Lakin’s Gates of Heaven series, this time following the quest of a twelve-year-old girl named Jadiel and her unlikely companion, a woodworking apprentice who is obsessed with finding a legendary bridge. Driven out by her evil stepmother to find the eternal-youth-giving leaves of a tree, Jadiel has only thirty days to come home victorious, or her stepmother will kill the one she loves most—her father. Young and innocent, Jadiel nearly ends her journey in disaster only days after she sets out, but she is rescued by Callen, an impetuous young man with good aim and little patience. Callen is seeking a bridge he has only seen in ancient drawings. As he and Jadiel work together to decode the strange writing on the drawings, they discover that the bridge is made from the same tree Jadiel is seeking. To find the tree, all they need to do is find the bridge. The only problem is that the bridge doesn’t exist. Or it’s invisible. Or it lies in a terrible, cursed land shrouded in darkness. The more they learn about the bridge and the tree, the more Jadiel and Callen find that their quest is not so much to discover a place as it is to discover the truth shrouded in rumours and lies. In Lakin’s usual fairy-tale style, this story brings together parables of Christ with talking toads and wicked witches; allegorical elements with echoes of Snow White. And readers of the whole series will be rewarded as various characters from The Wolf of Tebron and The Map Across Time appear here—the first time the stories have really started to cross over. Perhaps because one of the protagonists is only twelve, this one read more like a children’s story than the first two. That said, some of its best elements are also its scariest—a ghostly plain, a ruined city, and an escaped, ancient evil stood out as highlights. C.S. Lakin’s Gates of Heaven series continues with The Land of Darkness, a story woven of three threads: traditional fairy-tale, fantasy quest, and Biblical allegory. The first part of the story travels familiar fairy tale paths: After her mother’s death, a young girl, Jadiel, suffers under the harsh treatment of an abusive stepmother, but receives supernatural help from an unexpected ally. Her travails hark back to such classic stories as Cinderella, The Frog Prince, and The Wild Swans. To save h C.S. Lakin’s Gates of Heaven series continues with The Land of Darkness, a story woven of three threads: traditional fairy-tale, fantasy quest, and Biblical allegory. To save her bewitched father, Jadiel must undertake a perilous journey to obtain the leaves of a legendary tree. Her quest brings her together with apprentice woodcarver Callan, who is on a quest of his own, seeking a mythical bridge inscribed with wondrous designs he hopes to emulate in his own work. In the second half of The Land of Darkness, the quest and the fairy tale begin to intertwine with a Biblical allegory that folds together prophecy, parables, and the story of Christ’s death and resurrection. The twin mysteries of Jadiel’s trees and Callan’s bridge are revealed as they follow an eccentric guide through a land of illusion into a reality more profound than either legend or history. Where the allegory in Ms. Lakin’s previous Gates of Heaven books has at times been obscure and subject to multiple interpretations, The Land of Darkness makes the clearest connection yet to the Bible’s salvation narrative, which will please some readers who have struggled to confirm that link but might dismay others who preferred the more subtle allegory. All readers will be happy to discover more winsome characters, narrow escapes, mysterious puzzles, and a beautiful, magical fantasy realm whose borders continue to expand and reveal new delights. Characters and memorable spots from previous stories make cameo appearances, most notably King Adin from A Map Across Time (whose knowledge of an ancient language provides a pivotal clue) and his fabulous city of Sherbourne. In summary, The Land of Darkness is another showcase of skill and artistry from an ascendant voice in Christian fantasy, and a story that can be enjoyed by readers of all ages. To start with, I greatly enjoyed this book, although, I did have some problems with it overall. This is a fairy tale, in that, it has many of the troupes of classic literature, Biblical themes, and classic archetypes. This made the book feel very familiar and a nice romp into nostalgia, especially because it reminded me of some of my childhood favorites such as The Chronicles of Narnia and The Lord of the Rings. This story chronicles the story of Jadiel, a 12-year old who has been sent on an im To start with, I greatly enjoyed this book, although, I did have some problems with it overall. This is a fairy tale, in that, it has many of the troupes of classic literature, Biblical themes, and classic archetypes. This made the book feel very familiar and a nice romp into nostalgia, especially because it reminded me of some of my childhood favorites such as The Chronicles of Narnia and The Lord of the Rings. This story chronicles the story of Jadiel, a 12-year old who has been sent on an impossible quest by her evil stepmother to save her bewitched father, and Callen, a 30-year old man who has decided to go on a quest to find a mysterious bridge that he feels drawn to for unknown reasons. Over the course of their quests, they encounter each other and discovered that their journeys are linked. Deciding it is safer to travel together, they journey from one end of this magical world to the other trying to find what they are searching for. Along the way, they run into various different forms of trouble and meet various different characters. These experiences, eventually, lead to them discovering things about themselves and their place in the world. One of the things I loved about this book was the traditional themes, archetypes, and allusions contained within it. There was an evil stepmother and stepsisters, a bewitched father figure, talking animals, and magic mirrors, potions and spells. There was also a journey of self discovery and an conflict of good versus evil. The familiarity that these instances gave the story made it very easy to fall in love with and made reading it a much more enjoyable experience. Although, I enjoyed this story immensely and would definitely read it again, I did have some slight issues with it. The story felt a little rushed, and I wished Lakin could have added some length so we could get to explore the characters and the story-line a little more. The book felt a little two-dimensional to me and I would have liked a little more depth and expansion. That would have made the story a stand-out five star read for me. I will never forget the day I opened the package and saw the book, A Map Across Time my thought, “WHY did I agree to read a fairy tale!?! ?” I am so thankful I did. Because once again this author allows me to escape in The Land of Darkness, a wonderful tale of good versus evil, complete with an evil step-mother and her ugly daughters. However, the author doesn’t give you a Cinderella story. There are very interesting twists to the story that weaves a unique and thoughtful tale. And this time I go I will never forget the day I opened the package and saw the book, A Map Across Time my thought, “WHY did I agree to read a fairy tale!?! ?” I am so thankful I did. Because once again this author allows me to escape in The Land of Darkness, a wonderful tale of good versus evil, complete with an evil step-mother and her ugly daughters. However, the author doesn’t give you a Cinderella story. There are very interesting twists to the story that weaves a unique and thoughtful tale. And this time I got the allegory! The characters are wonderful, young Jadiel while still mourning her mother’s death is forced to deal with a wicked step-mother who wants her out of the way. Callen, the young apprentice for Jadiel’s uncle, is seeking a mysterious and beautiful bridge. Circumstances bring them together in their quest, where they face many unknowns. As the author mentioned in her interview, Callen is struggling with his faith and generally doesn’t look before he leaps. He represents so many of us in our struggle to trust. Once again there are quirky characters to aid the fairy tale element, Grork, the hoptoad being one of my favorites. The imaginary that the author creates in her words is once again beautiful. You can envision the places Jadiel and Callen travel on their adventure. You can also sense the fear and awe that they experience. Not just a fairy tale but also lessons of moral principles that ring true. Another great page turner in the C.S. Lakin series; The Land of Darkness is a remarkable fairy tale. I opened this book and was immediately carried away to an unknown land rich in color, dimension and detail, so realistic I soon forgot I was reading. I am new to the fairy tale genre and this is the second book in the C. S. Lakin series I have read. I never thought I would enjoy this type of story however C. S. Lakin has ma Not just a fairy tale but also lessons of moral principles that ring true. Another great page turner in the C.S. Lakin series; The Land of Darkness is a remarkable fairy tale. I opened this book and was immediately carried away to an unknown land rich in color, dimension and detail, so realistic I soon forgot I was reading. I am new to the fairy tale genre and this is the second book in the C. S. Lakin series I have read. I never thought I would enjoy this type of story however C. S. Lakin has made that possible with her writing style. The characters in Lakin's books are always interesting yet never boring. Lakin weaves together tales which hold significance in real life and yet are very easy to understand. The Land of Darkness carries the reader through riddles along the way, these riddles which have been scattered throughout the story grab the reader and pulls them in. I found myself as I read fully engaged in these riddles and trying to figure out what they might mean. Some of the riddles I connected to bible scripture and that is clear at the end of the story. This being another reason why I love the writing of Lakin. I am not one for tales of sorcery, witchcraft and evil depicted in fairy tales which is the reason for my avoidance of them. Don't get me wrong as the Land of Darkness does contain it's share of evil characters, but they don't give you nightmares. They are certainly G-rated and this is a book I would even recommend to the young teen. The Land of Darkness is about love, family, friendship and most importantly faith. This tale carries with it transcending morals and life lessons that would benefit any reader whatever their life experiences may be. I know, I’ve said this before, but I continue to be amazed by my level of enjoyment of fantasy novels. I never thought that it was possible for me to not just enjoy books like this, but to actually become an honest to goodness fan of the fantasy novel. I think the most appealing part of books like this is they are escapism at its finest. I love mythical creatures, adventure to places that only exist in the author’s imagination and the overall feel of books like The Land of Darkness. Now, don’t l I know, I’ve said this before, but I continue to be amazed by my level of enjoyment of fantasy novels. I never thought that it was possible for me to not just enjoy books like this, but to actually become an honest to goodness fan of the fantasy novel. I think the most appealing part of books like this is they are escapism at its finest. I love mythical creatures, adventure to places that only exist in the author’s imagination and the overall feel of books like The Land of Darkness. Now, don’t let the title fool you. This is not a dark and dreary book. There are some bad things that happen, but there wouldn’t be much of a story and there wouldn’t be much of a reason for Jadiel and Callen to end up on this adventure if their lives hadn’t brought them to this place. I thoroughly enjoyed every moment of this book and had many moments when it was hard to put down. I love it when I am reading a book and I find myself smiling simply because I am enjoying it so much. That happened a lot during the reading of The Land of Darkness. "The Land of Darkness" (The Gates of Heaven # 3) by C. S. Lakin was a very good read and happens to be Ms Lakin third in a series "following the quest of a twelve year old girl named Jadiel and her unlikely companion, a woodworking apprentice who is obsessed with finding a legendary bridge." One can clearly see the authors has a wonderful imagination and really does a great job at putting this all to paper for us readers to simply enjoy. I would definitely recommend "The Land Of Darkness" to anyone because I feel like it will offer you family, friendship, love and faith. So, I would recommend "The Land of Darkness" as a good read. Jadiel has a horribly wicked stepmother who literally wants Jadiel to die. But before she dies, she must find a certain combination of herbs and flowers to make a concoction that will give the evil greater power than one could imagine. First she sends Jadiel off to find bark and leaves from a certain tree. Jadiel knows this is wrong and fears for her father who is besotted with his new wife, actually a hag in the finest sense of fairy tales of the past! Then Jadiel meets a young man who is highly Jadiel has a horribly wicked stepmother who literally wants Jadiel to die. But before she dies, she must find a certain combination of herbs and flowers to make a concoction that will give the evil greater power than one could imagine. First she sends Jadiel off to find bark and leaves from a certain tree. Jadiel knows this is wrong and fears for her father who is besotted with his new wife, actually a hag in the finest sense of fairy tales of the past! Then Jadiel meets a young man who is highly skilled in woodworking and is off on an adventure to seek a bridge with apparently beautiful and strange etchings worked into it. Now, however, Jadiel and Callen will learn what is truly good and evil within and outside of themselves through the help of a prophet and other adventures they experience on this adventurous journey. I just didn't really get into this one. It is the 3rd book in the series and so I may have missed quite a bit from the first two (I really don't know- it felt like it was a stand alone with just a hint here and there that there might have been 'more to the story'). It has so much magic in it that I just felt annoyed. Yes, annoyed. There is a difference, to me, between God's wonderful creations and the 'magic' that He holds as compared to potions, spells and magic mirrors. To try to incorporate o I just didn't really get into this one. It is the 3rd book in the series and so I may have missed quite a bit from the first two (I really don't know- it felt like it was a stand alone with just a hint here and there that there might have been 'more to the story'). It has so much magic in it that I just felt annoyed. Yes, annoyed. There is a difference, to me, between God's wonderful creations and the 'magic' that He holds as compared to potions, spells and magic mirrors. To try to incorporate one into the other, or make the first visible through use of the second just taints peoples view of the power that God holds. Just my opinion- of course. Another incredible book in "The Gates of Heaven Series." C.S. Lakin has done it again - written a masterful tale that is a page turner from start to finish. The characters are strong, the plot gripping, and the writing descriptive and magical. In The Land of Darkness," we are introduced to Jadiel, a twelve year old girl who must complete a seemingly impossible task to save her father's life, and Callen, a woodworking apprentice who is obsessed with finding a mysterious bridge he saw on old drawi Another incredible book in "The Gates of Heaven Series." C.S. Lakin has done it again - written a masterful tale that is a page turner from start to finish. The characters are strong, the plot gripping, and the writing descriptive and magical. In The Land of Darkness," we are introduced to Jadiel, a twelve year old girl who must complete a seemingly impossible task to save her father's life, and Callen, a woodworking apprentice who is obsessed with finding a mysterious bridge he saw on old drawings. Jadiel and Callen's paths cross when Callen saves Jadiel from thugs who kidnap her. It isn't long before the two figure out their quests are joined. Along the way they meet a curious old man who is filled with riddles but bent on accompanying them on their journey. The message of faith and believing interwoven in the storyline is uplifting. The suspense and intrigue is enough to keep the reader on the edge of their seat. The middle of Los Tres Amigos has taken quite a liking to Lakin's books. He enjoyed reading The Map Across Time [check out our review here] and once the latest edition arrived he immediately began reading it. Lakin's story brings to mind C.S. Lewis and the Chronicles of Narnia series, yet there is a spiritual aspect to her tales that seems to distinguish her from C.S. Lewis. The story is appropriate for early teens and the characters are well defined. Jadiel and Callen embark on a path full of a The middle of Los Tres Amigos has taken quite a liking to Lakin's books. He enjoyed reading The Map Across Time [check out our review here] and once the latest edition arrived he immediately began reading it. Lakin's story brings to mind C.S. Lewis and the Chronicles of Narnia series, yet there is a spiritual aspect to her tales that seems to distinguish her from C.S. Lewis. The story is appropriate for early teens and the characters are well defined. Jadiel and Callen embark on a path full of action and readers will love immersing themselves into this magical world. Like the previous books in the series In the Land of Darkness is full of Biblical allegories. It's an adventurous tale which will keep readers captivated from cover to cover anticipating Lakin's next entry in the series. Destiny brings together two people for a greater purpose. Jadiel once had a happy life, however, that changed when her mother died in a terrible accident and her father married an evil woman who absolutely despises Jadiel. At every tur Destiny brings together two people for a greater purpose. Jadiel once had a happy life, however, that changed when her mother died in a terrible accident and her father married an evil woman who absolutely despises Jadiel. At every turn, Jadiel`s stepmother puts the young girl to work, sometimes it even seems like Jadiel`s stepmother is putting her in harm`s way on purpose. The Land of Darkness is the third book in the Gates of Heaven series. All three books are entirely independent stories but take place in the same land. In each case, the storylines resemble fairy tales with a twist of mysticism. At the heart of each are lessons about human nature and self-understanding. This is the third novel in the "Gates of Heaven" series. The three stories stand as independent novels, but they are all linked by the world and geography Lakin has created and a few shared characters. The story has everything a (grown-up) could want - mysterious creatures, a quest, a story that never falters. Together, Callen and Jadiel embark upon a quest, she to save her father and he to find the bridge. And do Callen and Jadiel find what they are looking for? You'll have to read the book to This is the third novel in the "Gates of Heaven" series. The three stories stand as independent novels, but they are all linked by the world and geography Lakin has created and a few shared characters. The story has everything a (grown-up) could want - mysterious creatures, a quest, a story that never falters. Together, Callen and Jadiel embark upon a quest, she to save her father and he to find the bridge. And do Callen and Jadiel find what they are looking for? You'll have to read the book to find out. It's a wonderful book and will take you to a different land full of magic and wonder. I really liked reading this book. I also read Lakin's previous 2 books in this series. I really enjoyed this story! I have appreciated each book of this series more than the one before, and I look forward to reading book #4. C.S. Lakin writes in a style reminiscent of the Grimm brothers or Anderson--her characterizations are simple yet enjoyable, and these books are filled with description and flowing narrative. The spiritual message here is very clear, including many direct quotes from Scripture, which makes this particular book not so much allegorical as symbolic along the lines I really enjoyed this story! I have appreciated each book of this series more than the one before, and I look forward to reading book #4. C.S. Lakin writes in a style reminiscent of the Grimm brothers or Anderson--her characterizations are simple yet enjoyable, and these books are filled with description and flowing narrative. The spiritual message here is very clear, including many direct quotes from Scripture, which makes this particular book not so much allegorical as symbolic along the lines of Pilgrim's Progress. There is much here for a reader to ponder, an urging toward true faith in the unseen. Beautifully done! Again, CS Lakin has managed to weave at tail that touches upon God and the help he gives us. Each person path is connected to someone for a time is what this book shows. The inner trials and test within us is one of our biggest obstacles to overcome..what's in our hearts. I am so impressed with this series. This book had more explicit ties to the Gospel. Wonderful! Author of "God is in the Equation" and "The Day Begins with Christ"